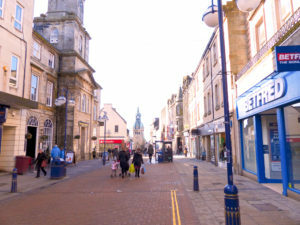 Two women were caught by police in Dunfermline High Street after stealing from a nearby store. Appearing at Dunfermline Sheriff Court were Nicoleta Filip (43) and Mirela Frasin (49), both of the same address in Kings Road, Rosyth. They admitted that on 10th February at Primark, High Street, Dunfermline, whilst acting together they stole a quantity of clothing. The two shoplifters appeared in the dock with a Romanian translator. Depute fiscal Azrah Yousaf said the incident occurred at 3pm. The women each had a rucksack and paid for certain items but left with others they had stolen. They were seen with the stolen clothes in their rucksacks and stopped by police in the High Street. Filip was found to have stolen items worth £92.50 while Frasin had £16-worth of goods she had not paid for. Roshni Joshi, representing Filip, said her client had been in the UK since November 2015 and was a cleaner at Marine Harvest in Rosyth. “She puts this incident down to a moment of sheer stupidity,” said the solicitor. Frasin is also a cleaner at Marine Harvest and has been in the UK since last September, said her solicitor Gwenn Haggerty. Sheriff Craig McSherry fined both women £300.